We all have them, I suppose. My grown niece is attached to a one-eared stuffed rabbit by the name of Bunny, hers since she was a toddler. My husband is attached to a potted ficus tree given to us as a wedding gift 36 years ago. He calls it the marriage tree and is petrified that it will die. I am attached to a place – a scruffy 230-acre spread in Crystal River, Florida, officially named The Plantation Inn and Golf Resort; it has been known locally for over fifty years as “the plantation”. This land plays host to all manner of semitropical vegetation and wild things while functioning, almost as an afterthought, as an 18-hole golf course. And its innate beauty is easily overlooked due to the aforementioned scruffiness. The resort has been through several owners, none of whom have taken any particular interest in the golf course. They all prefer to invest in the adjacent inn and its unique tourist business that peddles up-close-and-personal encounters with manatees. To me, though, the owners’ lack of attention to the course is a fortuitous thing because the land has been allowed to drift quietly toward its natural state. I first encountered the plantation many decades ago. The details of that visit aren’t all that important now except that it was a sort of foreshadowing event. I had never been to this part of the state before then, and I’m sure I assumed that would be my last visit here. As fate would have it, I now live only a short distance away and it has become my go-to place, my refuge. 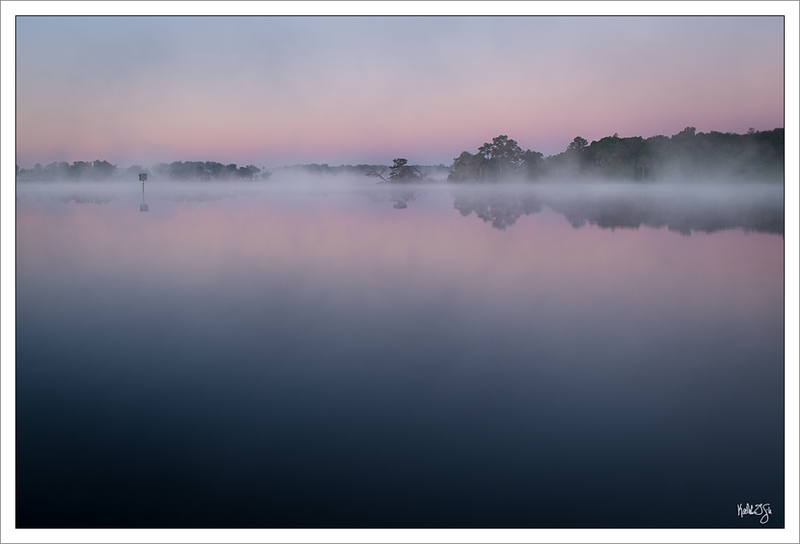 I visit often, usually at dawn when I have the place mostly and amazingly to myself. Trees are often painted with a soft morning glow and the wildlife seems oblivious to my presence at that early hour. Sometimes there is a moody fog, sometimes the cypress trees are turning orange, sometimes storks march en masse across fairways, and sometimes the water lilies bloom. Some years, the holly trees produce their stunningly-red fruit just in time for the holidays. I always bring my camera gear with me and I’ve generated quite a collection of plantation portraits over the years. Perhaps they will one day make it into a book. Birds are everywhere. Ospreys nest in sporadic tall pines and coots dart in circles in the many ponds and small lakes. There are anhingas with their wings stretched out to dry, snowy egrets, many types of heron, wood storks at times, and my personal favorite, the belted kingfisher. Bald eagles are not uncommon. 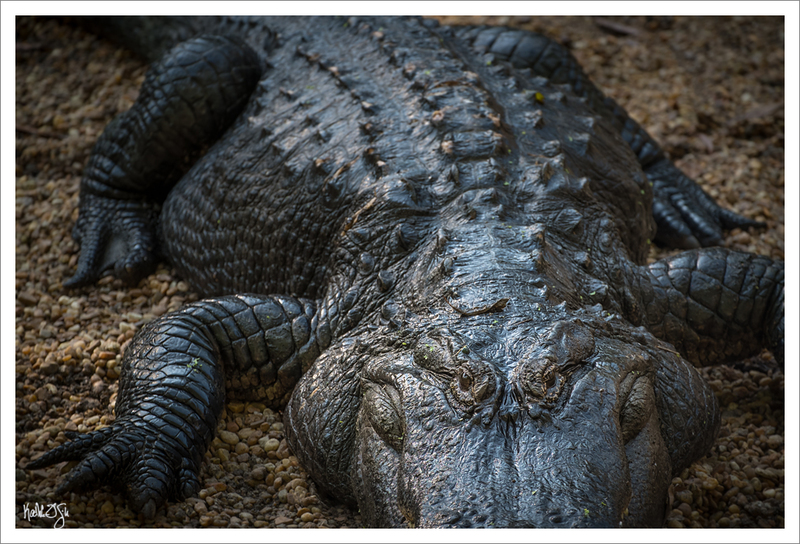 In the flightless category, there are alligators, of course, and turtles of all sizes sunning on fallen palms. Over time, greens-keepers have tried to enhance the place by planting trees. Hence, in addition to the native palms, pines and oaks, there are sycamores, holly trees and magnolias, as well as several varieties of cedar and cypress, with their shredding bark and knobby knees. There are cabbage palms growing in, around and through gnarly coastal oak trees. When I visit the plantation, stepping through dewy grass and along winding cart paths, I try to be unobtrusive. But workers busily mowing fairways and placing pins make eye contact with me and nod, as if my presence there is an important and natural part of things. I am fortunate to have this unique refuge and am justifiably attached to it. I just don’t want it to get too much attention. I started a journal a couple years ago, mostly to knock the rust off my writing. In flipping through past entries, I noticed one topic that cycles disturbingly through this self-indulgent tome. That topic is Balance – or more precisely, my despair over its absence in my life. It seems that I too often find myself doing one thing while wishing I could be doing something else. So I capture that angst in my journal, toss it into a bucket called “My Lack of Balance” and then set about thinking analytically, yet again, about how to fix this recurring problem. Unfortunately for me, the fix is almost always to work faster or more efficiently or to try to make my day longer by sleeping less. 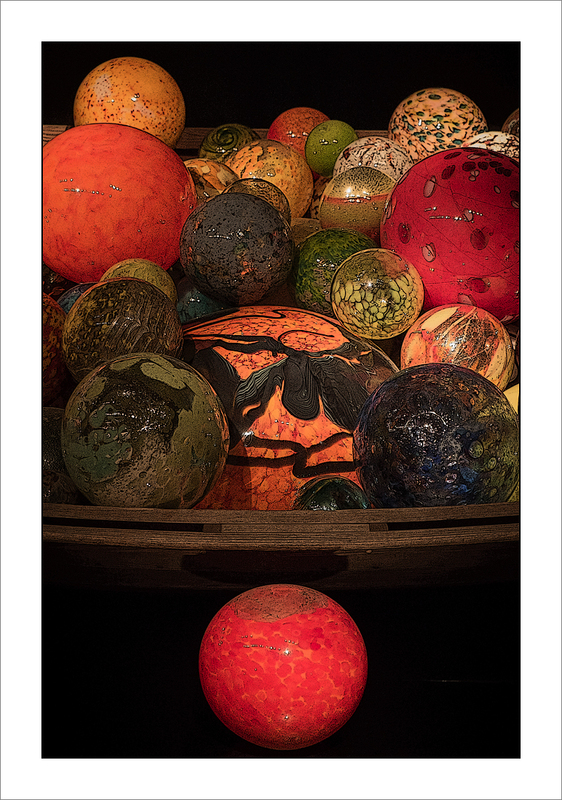 Anyway, I’m finally starting to see Balance as just an illusion, like this photo of a Chihuly glass work, which appears to be many balls balanced skillfully on one glass ball, but is instead just a small crop of a large row boat filled with those very glass balls. Here’s what I mean about Balance being an illusion. If you work 50 or 60 hours a week, perhaps more, and that makes you happy, and if you can live with everything else being a lower priority, then that is Balance for you. If that does not make you happy, and if you cannot continue to live with everything else getting the short shrift, and if you’ve been unsuccessfully wrestling with this for years, then what we have here is some sort of delayed gratification on steroids. Time to call it what it really is. Delayed gratification is one of those concepts you dutifully teach your kids, even though you personally loathe it, deep down inside. It is in that rucksack you have carried around since childhood, along with eating everything on your plate and arranging your life to please others. It is one of those ideas that works in small doses but may not be advisable as the general rule. It has, apparently, taken me six decades to begin to sort this out, and by “sorting out”, I only mean seeing it for what it really is. A choice. My choice. Note: The Float Boat is part of the Chihuly Collection, permanently housed in St. Petersburg, Florida. This collection is amazing in so many ways, but for me the best part is that the museum allows visitors to photograph, at will, anything in the museum. How forward-thinking of them. This abstract photo was taken without flash and processed in Lightroom and Photoshop. 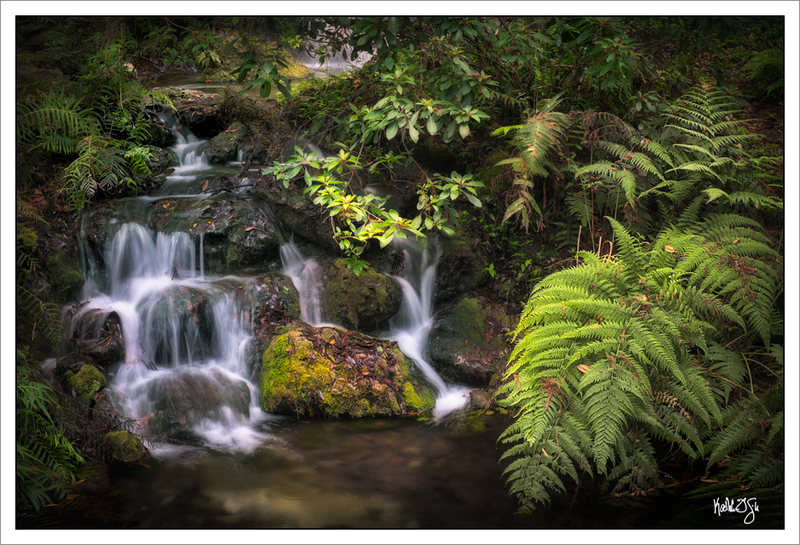 As I peered through my viewfinder and telephoto lens to make this image, I felt my pulse quicken. I was looking into this gator’s eyes. He is massive and from this perspective looks ready to lunge forward, legs tense and eyes alert. In fact, though, this gator is behind a fence in a wildlife park. He and his fellow pond-mates are overweight and pretty lazy. One rarely sees them move at all. So any real fear was in my mind and was about expecting the unlikely. As grown-ups, our fears are no longer about monsters and bogey-men coming to get us but they are still about expecting the unlikely – getting laid off, losing one’s home in a hurricane or tornado, running out of money, succumbing to early-onset dementia, and more. Wouldn’t it be grand if we could live our lives completely free of fear? 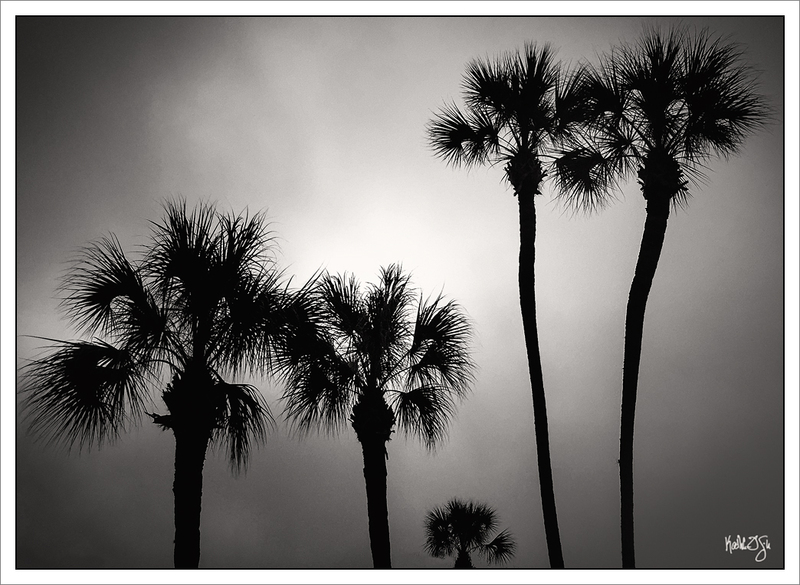 If I ever leave Florida again, I think what I would miss most is the Sabal Palm, known to some as the Cabbage Palm. Admittedly, there are more elegant palms here, but for me the Sabal is the most expressive. It looks a bit like a cross between a giraffe and Red Fraggle, but in a good way. In spite of its seeming fragility, it has evolved to deal with the periodic pounding of tropical storms. It is exuberant, dancing to the beat of its own drummer – standing tall or twisting and bending in response to some unseen influence, occasionally hugging tightly to a nearby oak. I can see a line of arching Sabal Palms from my pillow. The palms come close to our screened porch, not quite touching it but leaning in gracefully and in unison. At first light, I can hear squirrels scampering across their crowns, so close together are they. On these spring nights when the doors to the screened porch are flung wide, the palms transport me far south to some balmy and untouched tropical island and I fall asleep to the sound of softly rustling fronds. Most of us are immersed in “stuff”, both physically and mentally. Our limited time is spent not on what we’ve chosen but on what we’re confronted with. We dilute our lives with so much of everything that the overall effect is to mire us in indecision and make everything just mediocre. It occurred to me recently that so many things in life might be made better by the simple act of culling. Of making decisions between and among things, of picking what’s most important and shedding the chaff, even if there’s only a hair’s breadth between the two. Perhaps this often-painful process can make enjoyment of what remains – the carefully chosen – so much sweeter. Perhaps our possessions, how we spend our time, the words we use, the art we make and even our thoughts can all be honed and subjected to the same meticulous process of separating the true gems from the mere minerals. Culling takes courage, but I believe it refines our ability to be decisive, to take risks, and to discern true beauty or value from a steady menu of mediocrity. The result could be a simpler, more focused and more meaningful experience. For me, 2015 will be about culling. I know very little about Native Americans, and less about the Timucua, who were among the early inhabitants of Florida. But what a magical existence they must have enjoyed here on this unusual river. Their story is the familiar tragedy; the population was decimated by the mid-1700s and the last few individuals deported to Cuba. Often when I gaze out at the river, with no other witnesses save the occasional curious otter, I am reminded of those first and rightful owners. I feel their presence, especially in fog. Each day this past week, they appeared in that ephemeral fog, slipping in on silent moccasins before each early twilight and lingering until forced into hiding by the warmth of morning sun.